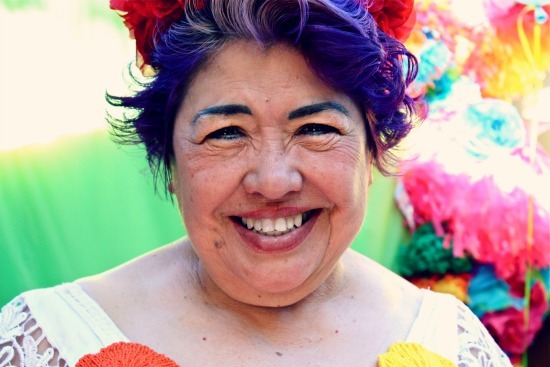 MAMA Q: Recently my mamacita turned 75 and there was a big family fiesta thrown to celebrate. 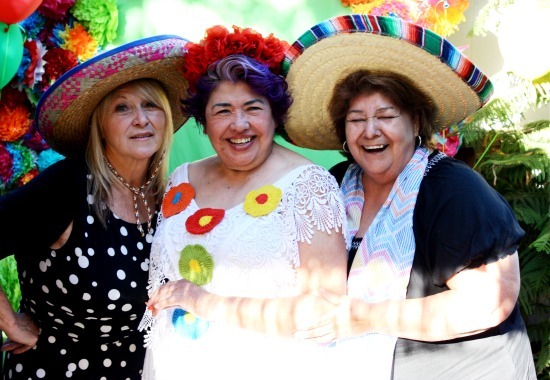 It was a colorful gathering of family, more family and childhood friends and there were tables of tasty Mexican food, desserts and drink as well as lively conversations. Many of us hadn't seen each other in year, many met for the first time, and it was a joy to see at the center of all the festivities, my beautiful and fun-loving mother. Her party dress was a confection that she made from a thrifted lace dress picked up at the Goodwill and embellished with brightly colored crochet flower applique, and she wore a tiara of red silk roses. When she was asked to share her secret for looking young, she said with a relish, "be good but not too good. And wear lots of bright colors!" Well, if wearing bright colors can extend your years, we are most certainly going to celebrate her birthdays well into the hundreds. And for that, I am very glad. Here's to many more years of happiness and joy, Mama Q. I'm wearing red today for you. I am really hogging up all the birthday months. I think I will just continue celebrating everyday of the year. Bring it on. Thank you my lovely Bella. She looks like you! Or... I should say you look like her. What nice pictures. ohhhh, love so much your fabulous mom's attitude and also love how beautiful she looks, with that pretty tiara on her purple hair! !, gorgeous woman!! If your mom is right, then we are going to live forever!!. Glad you shared this with us, thank you! Ah.. you have Mexican roots! Never knew that. Your mom looks lovely and you two resemble. The fun is jumping from this photo.